Romantic song of Jo Jeeta Wohi Sikandar movie originally sung by Udit Narayan, Sadhana Sargam is recreated by Sanam. 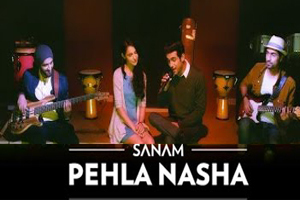 The video of this song is available on youtube at the official channel Sanam. This video is of 4 minutes 01 seconds duration. Lyrics in Hindi (Unicode) of "पहला नशा"